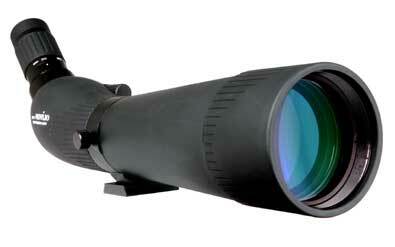 The T80 Spotting Scope Olivion is perfect for serious terrestrial observations such as bird-watching etc. Optical performance is excellent, delivering crisp, bright, sharp, high-resolution images, across the entire field of view. The objective lenses are multi-coated for maximum light transmission and image contrast. A Zoom eyepiece is included with each model as standard. Focusing is ultra-smooth and practically eliminates vibration whilst in use. The tubes are covered with a protective rubberised paint finish to help protect from the elements in addition to being NItrogen filled fully waterproof. All models can be mounted on a standard photographic tripod via a ¼" tripod bush. Supplied with stay on case. The 80mm ED spotting scope uses cutting edge optics which provides excellent colour correction and razor sharp images for serious nature and bird watchers. It is optimised for both day and night viewing. This remarkable spotting scope is for those particular on their equipment and hobbies. It uses high-quality optical lenses that have a high content of fluorite, which reduces deviation in your images. These special lenses are called ED (extra-low dispersion) lenses, and are mainly used in powerful telescopes.